Hello, my name is Todd and I’m a pinehead. 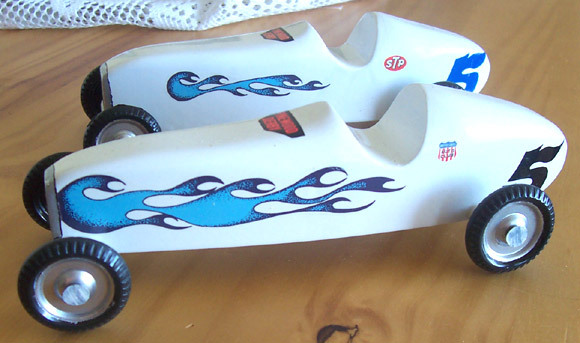 I’ve been collecting derby cars for over 10 years. My addiction began innocently enough with some boxes of my stuff that my parents had packed up when they moved. It was mostly junk. Then I found my three derby cars and a couple of trophies I had won. Thank goodness I hadn’t blown them up like most of my other toys! I started reminiscing about the fun times I had in scouts, and how much fun we had during derby season. My mom and dad got a little crazy, and I had to wrestle the cars away from them from time to time. Anyway, after remembering the good times, the cars and trophies went up on the shelf for a couple of years. 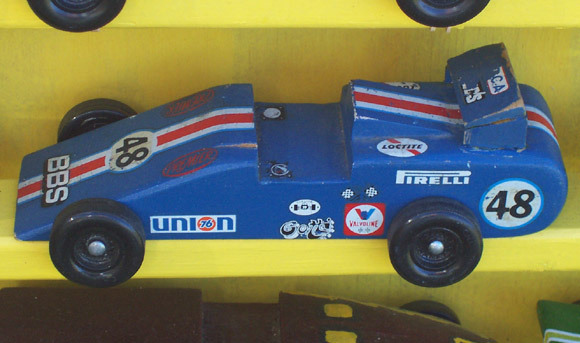 One day, my mom and I were at an auction and there was a nice old derby car there. I bought it and put it on the shelf next to the others. One day when I was looking at the cars it popped into my head that these things would be fun to collect! I was hooked. After my first year of garage sales, I had about 35 cars. After the second year, I had 75. Then I got on the Internet and the hook went in a little deeper. Before I knew it, I was up to 175. My wife told me I had to slow down, so I had my mom buy some for me on the side. My wife wasn’t happy when she found that out – I think she knew I had a problem. Lately, I have let more more cars go than I have bought. I haven’t gone cold turkey, but I have gotten a little picky. I’m still a pinehead. My son, Chris, and I built our first car together when he was four. He loved to work the drill press. He is twelve now and out of scouting, but he had fun while in scouts. I still keep up with my scout friends as I have made my collection portable by making folding cases to hold the cars (Figures 1 and 2). I take the collection to local pack and council events. Most of the cars I get now are from donations from packs where I show the cars. 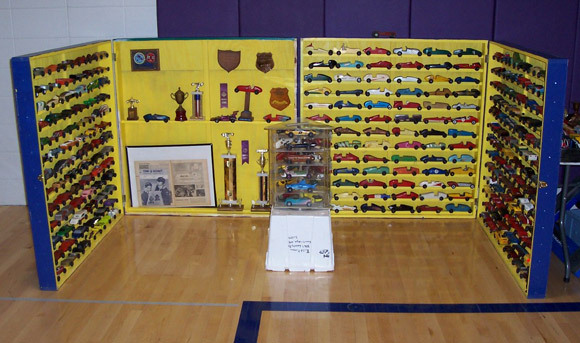 I have over 700 cars and derby memorabilia on display. I also have about 200 cars that were used in the movie “Down and Derby”. 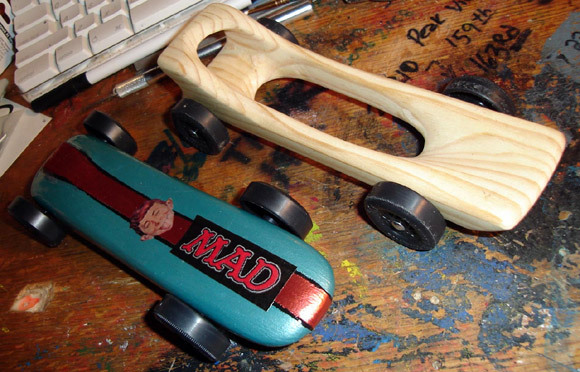 My cars have also been featured on a pinewood derby web site, but my friend and fellow pinehead has since passed on to ‘Derby Heaven’. I don’t really have any one car that is my favorite car, but I do have some special cars. 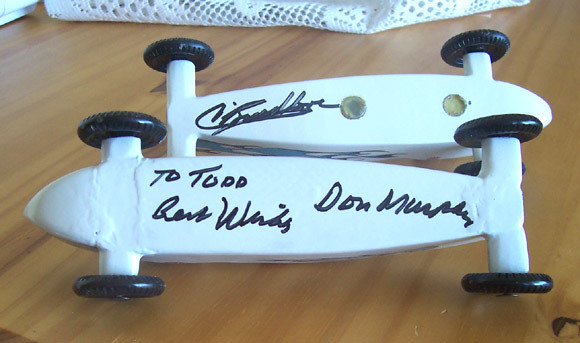 Two are cars made for a vintage race in California, signed by Don “The Creator” Murphy and Craig Breedlove (Figures 3 and 4). I also have a car that belonged to the brother of the Olson Twins (Figure 5). That’s enough for now. If anyone has questions or would like to see pictures, I can be contacted at ‘toddpaxson (at) yahoo (dot) com’. Also, if you are close to southern Wisconsin and are interested in having me display my collection at your event, you can contact me at the above email address. Once again Maximum Velocity came through for Jack’s derby car, and we didn’t really hold to speed specs. Jack had never lost a head to head race in the past two years, collecting 1st Place in speed in his category at the pack meetings, and winning 1st Place in district. After last year’s race he told me that he wanted to go for style this year. This is what he came up with. He got 1st Place in style and will be entered in district in the style category. He also got 2nd Place in speed. He was very close to collecting top honors in speed and style, but he is mostly proud of his 1st Place style finish. 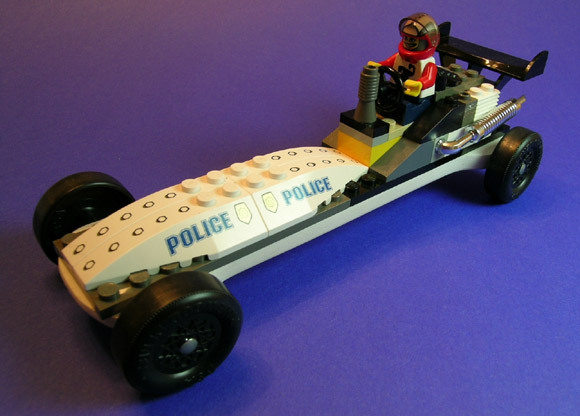 I really like this car because he designed it and put it all together – I didn’t have to do much this year. My son and I set out to make our 2006 cars stand out from the crowd. My son wanted to have a car that was barely there. We worked on the design on an ‘as it goes’ basis. Originally we were going to put the weight in the back upper portion of the car, but thanks to a Dremel incident we had to chop out the space. The car was only 3.5 ounces. It ran sharp, but did not win anything. Regarding my car, I love Mad Magazine, ever since a fateful day in 1977. Alfred was fast but not a winner. 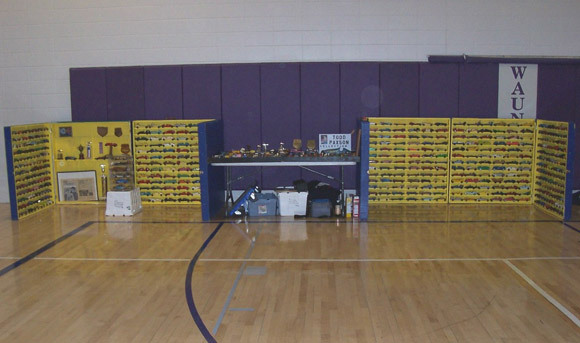 When I sent you the info on my son’s great experiences at the pinewood derby using the fantastic info you have provided, I was so excited that he had taken first in every race, set a track record and was on to Districts that I forgot to include the 2 cars that I had built for the adult/sibling race. The idea for these cars came from our local Halloween parade. Our pack had entered a float (the Flintstones’ mobile), as the theme this year was cartoon characters. We took Grand Prize with the float. I decided at that point I would make a Flintstones’ car and a Rubble mobile to enter in the race. The cars were a big hit with all the men and the kids alike. Wilma and Betty didn’t win – heck Wilma barely made it to the finish line – but we laughed so hard and had such a good time. 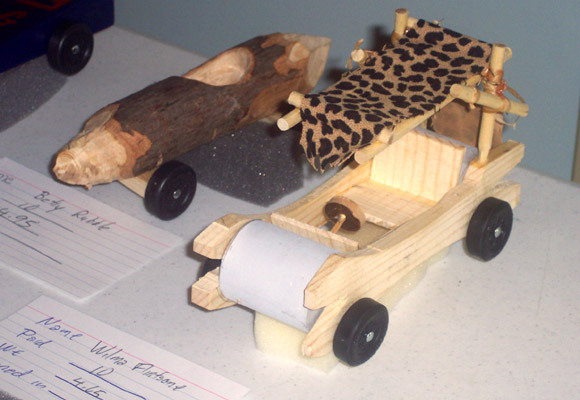 The Flintstones’ mobile used all scrap wood from the workshop, and the Rubble mobile was a limb I cut from my brother’s burn pile. The only thing ‘official’ on either car was the BSA wheels and axles. My seven year old grandson was in his first pinewood derby race this year. He was very proud of his car, as he and his dad had worked long hard hours getting it just right (his dad builds and races real race cars at different race tracks in our state). My grandson wanted it to be perfect. The race started, and with all of the excitement of a seven year old and an avid race fan of NASCAR he watched as his car went down the ramp. He came in first place 2 times and second place two times. Each race he would look over at me and give me a thumbs up sign. Do you have any experience with trying to suspend graphite in a liquid for easier application to the wheel shaft? I have tried to use graphite in suspension (isopropyl alcohol), but with no success. Graphite needs to be in a powdered form to work best, and it will self-regulate to the amount needed. If you get too much graphite in the bore, the wheel will spin slowly until the excess graphite is shed. So the key is to keep adding and spinning until the wheel spins at peak performance. Generally, we add graphite 5 times, spinning at least 10 times by hand after each application. Graphite suspension puts too much graphite in the bore, and since it is essentially caked into the bore, it takes quite a while to shed the excess. Many of the current BSA axles (nails) have an off-center head. Do you think this would cause problems with performance? Since the axles don’t rotate, the out of round head generally causes no problems. The only issue would be if the head was so off-center that the edge of the head contacted the faux-spokes on the face of the wheel. In this case, the head would need to be trimmed down, or the axle replaced. Does angling the axles (head higher than the tip) help performance? Theoretically, if the wheel/axle system is running perfectly (minimized friction, dead straight mounting, perfect alignment), then straight and flat is best. But in practice, perfect is impossible to achieve. So, implementing an alignment technique known as “rail-riding” will generally give best performance. This technique involves angling the axles and then adjusting them for alignment.